It has always been a policy of mine no matter who you are, and if you have something to say and I would say Perri Rhoades, (who did an excellent job). That you should be allowed to speak, that no one has the right to shut you down…period. Like some tried to do on Flayrah. Ahmar may have been referring to those who disagree with Perri using our comment karma system to rate down her scores of comments. No one on Flayrah staff had censored Perri. In fact people can still comment there if they wish, including Perri. 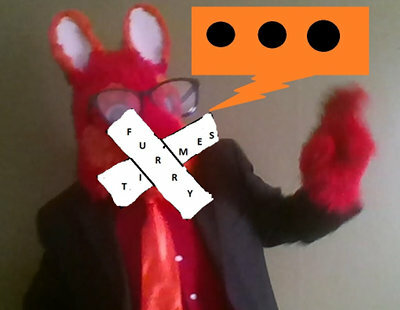 However, in a fit of irony, Furry Times closed comments on their article which had shamed other sites of censorship. Let’s take a look at why a site preaching for free speech cut the conversation short on their own controversial article. Fur Affinity has banned adult artwork of underage characters, after payment processor AlertPay cited it as a reason to cancel the site's account. Right now we have to make a choice. Do we continue on with cub artwork and protect the artwork in the name of freedom of speech? Or do we remove the one Achilles heel that has proven itself to be a liability and a frustration? If we want to keep Fur Affinity alive we have no choice but to remove cub art. Artists have 21 days before administrators begin removing such content from their accounts. Non-adult artwork will not be affected, nor will "chibi", "cutsey", or "stylized" characters. Site administrator Dragoneer noted that no artist will be punished for the presence of existing artwork, and warned that harassment of artists will result in a three-month ban. Both Dragoneer and Pinkuh recommended SoFurry and Inkbunny as alternative hosts. First and foremost, Fur Affinity was always intended to be an art site […] Unfortunately, that was never emphasized and certain aspects became… too casual. The change raising the most debate was to ban human and proto-human minors in mature situations, based on UK, Canadian and Australian law. The site's definition covers elves, dwarves and "neko-style characters" — humans with non-human ears, tails or paws. Other altered policies restrict keyword abuse, unoriginal or underdressed photography, most second Life screenshots, hard-to-see images and unoriginal photo edits and memes. The definition of flooding has changed and a restriction on comics using generated art has been introduced. For those of you who follow world-wide internet policies, China's list of banned websites continue to grow, actively filtered out by what's colorfully coming to be called 'The Great Firewall of China'. Out of curiosity, I began testing which websites are banned. And the first one I entered to see reported inaccessible? Furnation. Incredulous, I ran the test again, and a few more times. 1 successful attempt to reach it, out of 20. It leads to curious speculation; is it something as simply benign as a router misconfiguration? Perhaps a few servers along the way had conked out? Maybe Slashdot having linked the testing server has resulted in a sudden drop of reliability of the testing method?